On October 30, 2015, U.S. Secretary of Housing and Urban Development Julian Castro participated in a Minneapolis forum on affordable housing. With nothing better to do on a Friday morning, I picked up a notebook and decided to play journalist. Enjoy. Secretary Castro at Mayflower Church in Minneapolis. From the Star Tribune. I first saw Julian Castro as the nation did, the keynote speaker of the 2012 Democratic National Convention. Young and charismatic, the San Antonio mayor shared the story of his childhood, the influence of his Chicana activist mother, and all the that carried him to that stage that night. Watching live on the small-screen of my iPad, eating leftovers in a Houston apartment I couldn’t afford, like many around the country I wondered if this was his “Audacity of Hope” moment. Like that state senator of Illinois, he stressed the importance of the one thing that makes all the difference for those who find all the world pointed at them: Opportunity. It’s this that allows us the chance to rise above our circumstances—and the more we have, the freer we are to live the life we seek. I was so enamored with Castro’s message that, afterward, I texted a friend of mine who was a delegate to the convention and asked she bring back one of the placards with the word on it. Hanging on the wall right above my desk, I’d often rest my eyes on it, reminding myself that you can’t fault a man for not trying if he’s never had the chance to. That’s something we forget about—because it’s so much easier to judge a man for staying on the ground than offering a hand. The next year I saw Castro in person at the 2013 Young Democrats of America convention in San Antonio, though truthfully I can’t recall a word of what was said—either of his speech or at the convention as a whole. All I’ll say of those nights is that the rumors are untrue, I’ve already apologized to the state of Delaware, and yes, I’m also surprised I could fit a whole bottle of wine in my coat pocket. (See you in 2017, young liberals). In the years since, Julian Castro’s proved to be the rising star the pundits said he was, with President Obama appointing him in 2014 to serve as the U.S. Secretary of Housing and Urban Development (HUD). Given his successes in San Antonio, the hope is that they will be replicated in cities like Minneapolis, St. Louis, and Sacramento, each designated “promise zones” in reducing poverty and crime and improving economic opportunities. The HUD designation is meant to be as encouraging as it is aware of who often gets left behind when a city’s loudest boosters are its hip, young professionals—that is to say everyone who’s still chasing after what Castro spoke of three years ago. 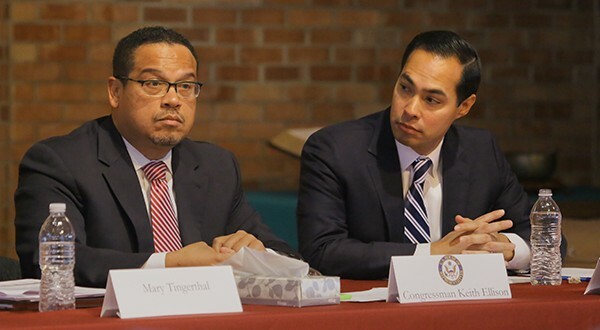 On Friday, Secretary Castro joined Congressman Keith Ellison at Mayflower Church in Minneapolis for a forum on affordable housing (a topic I’ll admit I’m only aware of because I’ve yet to find it). When I arrived that morning, taking a seat in one of the pews near the front, it was only minutes before the crowd of 100-or-so community leaders, activists, and others entered, turning the chapel from a room of whispers and quiet rustling to one of chatter and laughter and hugs from those who’ve crossed paths surely a hundred times. A glance around the room found a majority of the attendees were white, with about half of all attendees being in their 50s and 60s. Congressman Keith Ellison and Secretary Julian Castro. From Finance & Commerce. When the forum started, Ellison mentioned his working experience with Castro as a member of the House Committee on Financial Services, which oversees public and assisted housing. The Secretary, he said, represented “responsive, listening government, there to plug people into the issues they care about.” And as for the importance of affordable housing, it is “not just about finding houses where [people] want to live but where they aspire to live” and “our community, as much as we’re proud of it, has some of the biggest disparities.” Whether it’s housing, employment, or education, he said, “if we can create prosperity for white people, we can do it for everybody.” The forum was to continue the conversation on how best to do that. The Secretary and congressman were only two of the seven-member panel of suburban mayors and community leaders, each of whom introduced themselves and left no doubt what their views on “communities of choice” were (all in support, it turns out). They ran down the list of problems and placed the issue of affordable housing in its proper context—that it is inseparable from racial equality and equal access to employment, quality education, and so on. But to see the issue in this way, they said, requires a level of collaboration that for decades did not exist and which the designation of promise zone seeks to address. The panel also agreed that in addition to investing more into these communities, local stakeholders must be included in the conversation on how best to focus that investment. And they need to be brought in from the beginning, not at the end when they’re just expected to sell it back to their communities. For example, when it came to the construction of the new light rail line, it’s preposterous that advocacy groups had to sue the federal government and Met Council just to ensure it included stops in neighborhoods with low-income families and people of color. As Gary Cunningham of the Metropolitan Economic Development Association said, “People fought and died for our right to live where we want to live” and “at the end of the day it’s about power—and if we don’t have it, we can’t push our agenda.” Participation is a way to seize that power. When at last the forum opened up to the audience, at least half of the thirty comments and questions came from people of color. Most offered ideas of how best to improve housing access, sharing their own negative experiences in a minute or less. One brought up the trouble of expunging unlawful detainers from one’s record. Another noted the discrepancy in eviction rights for people in public housing (stricter) than those in homes backed by an FHA-insured loan, at least as it pertains to the criminal records of tenants. To the extent there was any combativeness, one woman said she was turned off by the “ill power” in the room—“I haven’t seen people take notes up there” (to which several panelists held theirs up). As for any reference to Castro’s vice presidential ambitions (based on Hillary Clinton saying she’d consider him for “anything, because that’s how good he is”), it was alluded to just once, as an aside. Immediately all eyes turned to the Secretary’s demeanor, which remained calm, hands neatly folded on the table—blinkblinkblink—but otherwise unfazed. This is his life now, and I can only speculate about what such speculation will do to a man. I expect he gets more invitations now, more friends appearing out of the woodwork. But until the secret service shows up to his door (or doesn’t), he won’t be able to walk into a room without someone bringing it up. Now that Minneapolis is a promise zone, I suppose we’ll find out what that means. “Where there is a constituency driving an issue, you will get change,” Ellison said, closing the forum a few minutes after noon. “It’s a law of political science.” Part of his work—and for everyone in the room—was to ensure housing remains a priority for the government. Because, frankly, he noted, there are some in Congress who believe fewer dollars ought to be invested in these neighborhoods, HUD’s budget slashed completely. It is up to activists, then, to put pressure on elected officials to “enlarge the pie,” even if there are differences in opinion over how best to cut it. I didn’t even have a chance to put my pen down when, around me, half the audience rushed forward, a mob of suits and ties and outstretched hands grasping for the table. Suddenly, it was one great, excited wave that moved toward the stage, like the wave that carried Castro himself from being a Texas mayor to U.S. Secretary—and perhaps in a year’s time the first Chicano vice president of the United States. Watching the scramble (including the scramble out the backdoor to a waiting vehicle), I found myself giving into the nagging doubt that perhaps nothing ever quite changes. That all of these problems will be here five, ten, fifteen years from now. So much of the panel was about seizing power and participating in the process, and it occurred to me then that this includes taking control of the very the language we use. It’s up to us to ensure that words like Hope and Change and Opportunity maintain their meaning, because we’re the ones who decide their meaning. If we want them to be merely beads we string together at pub crawls to say, “I’m on your team,” then fine. If we want more, then it’s up to us. What we make of the language is what we’ll make of the world. I’m skeptical of what emerged from the forum, but I also know that change is gradual and issues like affordable housing, which is so intimately tied to racial equality, probably won’t be solved in the next five, ten, fifteen years. But that’s because change is gradual, not because we aren’t trying. Like the transition from summer to fall, social change goes unnoticed until at last one realizes they’ve worn their wool cap for weeks. Truthfully, I’m just proud that for an issue that so disproportionately affects women and people of color, never in my life have I seen a seven-member panel that did not include even one white male. One can read into that what they will, but it’s a detail that can get lost when one returns home to find rent’s due the next day. But the leaves have turned. There on the stage was the progress of the Civil Rights movement, a testament to the value of grassroots organizing and electoral politics. How could one say these things don’t matter when listening to the first Muslim-American congressman talking policy with a Chicano Secretary appointed by a black president? It doesn’t always feel like fall, and even if I think this forum will be forgotten, perhaps it’s enough just to notice the weather’s changing. You make a convincing argument. Let me look into it.